While the object of the game is to get as close to 21 without busting, mathematicians quickly realized that it is not always the best strategy. You are playing against the dealer. There are many situations where it is wiser to stand on a low hand because the odds of the dealer busting are in your favor. The object of the game is to get as close to 21 without busting as you can. 2 through 10 are worth their numerical value. Aces are worth 1 or 11. Any hand where an ace can count for either a 1 or an 11 is considered “soft”. For example, an Ace and a 6 add up to a “soft 17”. This means you can still hit without going over 21 and busting. If the player likes his hand he can “stand”. There are lots of rules that can vary from casino to casino. They are important because they can have a great affect on the odds of the game. The dealer typically must stand on 17. One rule to watch for is if the dealer may hit on “soft 17”. Splitting: Different casinos have different rules on splitting. Typically you may split any pair of like cards. All face cards are considered 10s and may be split. Some casinos will allow you to split up to 3 times while others have restrictions on splitting. Doubling Down: You may double your bet on a hand. This is called doubling down. You will receive one more card and may not hit again. Again, casino rules will vary from place to place. They will place restrictions on what hands you can double on. Surrender: This rule allows you to surrender your hand if you feel you have no chance against the dealer's hand. There are two types, early surrender, and late surrender. You lose only half your bet. This rule gives the player a great advantage and it is tough to find casinos that offer surrender because of this. Insurance: If the dealer's face up card is an Ace you can place a separate bet that he has blackjack. As a general rule it is not advantageous for the player to use insurance. There are 4 major components to beating the game of blackjack. The first key to beating the game of blackjack is knowing basic strategy cold. You can pick up a basic strategy chart in most casino gift shops, or find them online. I have included one such chart with on this site. There are programs that can help you learn this strategy very well. There is a free website called www.hitorstand.net. I would recommend starting by having the basic strategy chart in a window that you can refer to, or printed out. As you become more familiar you eventually try to play from memory. It is vital to understand when practicing on this site that your goal is not to win money. It is simply to make every move in accordance with basic strategy flawlessly. There is absolutely no point in learning how to count cards until you know basic strategy cold. In 1956 a paper by Baldwin, Maisel, Cantey, and McDermont published in the Journal of the American Statistical Association gave birth to the idea of basic strategy and the idea that blackjack was a beatable game. Ed Thorp took this idea to the next level, running statistical tests on MIT's computers refining basic strategy to essentially what we know it as today. Ed Thorp's studies led him to understand that each card that was dealt changed the odds of what future hands would be. In essence, blackjack has a memory. It was this discovery that led to the idea of card counting. His book “Beat the Dealer” released in 1962 is essential reading for any serious card counting student. This book is pretty much where it all started. There are many methods of card counting, but the most widely used method is called the “Hi-Lo” method. What Ed Thorp discovered was that when there are more tens and aces in the deck it favors the player. When there are more low cards, 2 through 6, in the deck it favors the dealer. There are 20 tens and aces in a 52 card deck. There are 20 low cards in the deck. Most people think that you must be a genius to count cards. It takes a lot of practice to do this in your head, but it is more a matter of practice and determination then IQ. Anyone of reasonable intelligence can learn how to do this. In the Hi-Lo system all low cards, 2 through 6, are valued as +1. Tens and aces count as -1. When the count is positive it favors the player. When it is negative it favors the dealer. There are many ways to take advantage of this information. The main idea is obvious; bet big when the count is positive, bet small when the count is negative... ...or leave the table. Techniques were developed to make the most of the advantage of a positive count. There is a technique called “Wonging”. This technique is named after noted author and gaming strategist Stanford Wong. You watch the table and wait for the count to go positive, and then jump into the game. Another technique that utilizes the same line of think is the spotter/big player team play. If you saw the movie “21” this was their main approach. The spotter plays the table minimum and waits for the count to get hot. This person then signals the big player to come in. The big player immediately starts betting big. When the deck cools the BP leaves. In order to discourage card counters most casinos deal multiple decks. While it does make it more difficult it is not impossible. The true count is calculated by dividing the running count by how many decks are left in the shoe. If your running count is +5 and there are 5 decks left in the shoe your true count is +1. If your running count is -6 and there are 4 decks left your true count is -1.5. You must estimate this amount. With practice you can become very accurate at this. One tip I caught from the movie “21” is to use something called “Memory Pegs” to help you keep track of your count while simultaneously calculating your hand and bet amounts. In the movie they used these “memory pegs” to communicate what the count was in code. “There goes that paycheck” meant that the count was +15. While this is an innovative application, converting the count into memory pegs will help to keep your mind from becoming cluttered. It is very easy to lose your count when you are dealing with so many different numbers. If you convert your count into words it will help you to remember what the count is. Learn to use this list and it will cut your time in learning how to count cards dramatically. Once you know basic strategy cold and you can keep the count it is time to include deviations into your game. 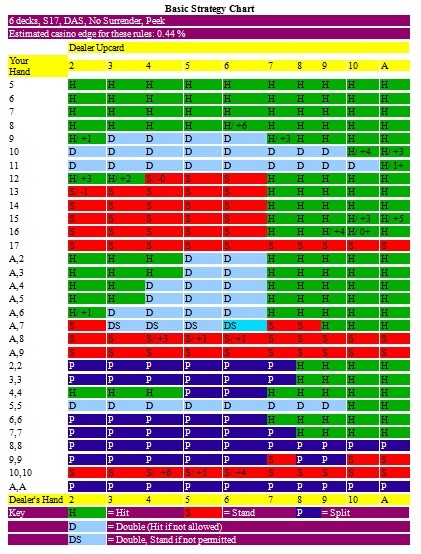 I have included 21 deviations from basic strategy into the chart. There are many more, but these are the essentials. I have written the deviations into the basic strategy chart. I have listed the deviations and written the descriptions under the chart. 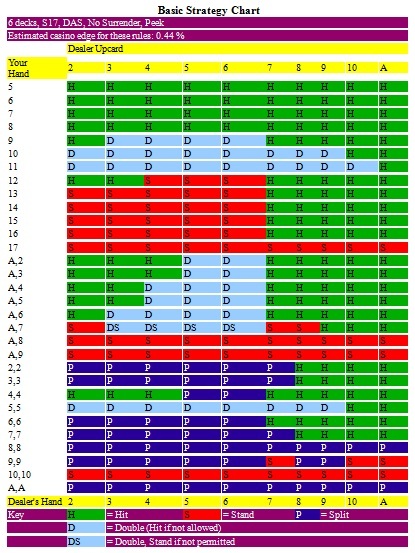 If a deviation has a +4 by it, it means that you should deviate from basic strategy when the movie is +4 or higher. Most of the deviations are for positive counts. There are a couple where you are supposed to hit instead of stand when the count goes negative. 16 stands vs. 9 at a true count of 4 and above (Unless you can surrender). 16 stands vs. 10 at any positive count (Unless you can surrender). 15 stands vs. 10 at a true count of 3 and above (Unless you can surrender). 13 hits vs. 2 at a true count of -1 and below. 12 stands vs. 2 at a true count of 3 and above. 12 stands vs. 3 at a true count of 2 and above. 12 hits vs. 4 at any count below 0. 10 doubles vs. 10 at a true count of 4 and above. 10 doubles vs. Ace at a true count of 3 and above. 9 doubles vs. 2 at a true count of 1 and above. 9 doubles vs. 7 at a true count of 3 and above. 8 doubles vs. 6 at a true count of 2 and above. A soft 19 doubles vs. 4 at a true count of 3 and above. A soft 19 doubles vs. 5 at a true count of 1 and above. A soft 19 doubles vs. 6 at a true count of 1 and above. A soft 17 doubles vs. 2 at a true count of 1 and above. A pair of tens splits vs. 4 at a true count of 6 and above. A pair of tens splits vs. 5 at a true count of 5 and above. A pair of tens splits vs. 6 at a true count of 4 and above. The key to making money when counting cards is to bet small when the count is negative and bet big when the count is positive. Most methods teach you to multiply the count by one unit until you reach your max bet. You want your max bet to be at least 6 times larger than your minimum. I have been on forums discussing this and have met with the same resistance I do on the sports forums. The skeptics swear up and down that a chase system cannot work. Foolishness!!! My own tests have shown that chase systems enhance the profitability of counting cards. You simply must abide by the same rules as the flat bettors. You want your max bet to be at least 6 times larger than your minimum. Here is the chase system I have been using. It is a 3 tier system that adjusts when the count goes up. If you lose 3 times in a row you abandon the chase and start over. The table minimum is $10 and the max is $500. Each casino will have different rules so you must adjust accordingly. My tests of this system have been successful. You must understand that even winning strategies will lose money from time to time, but long term you will win. You should be winning approximately 52% of the time... ...but execution must be flawless. One mistake can destroy an hour's worth of work. It would seem that chasing systems are just as controversial in blackjack as they are in other games of chance, but what you need to know is that betting systems do not change the odds. If you are playing a positive EV game then chasing systems cannot help but work in the long term. These are basic laws of mathematics. You will have a lot of people try to tell you differently. The people they are quoting have assumed you are playing a game with negative expectation. If you are counting cards this is simply not the case. Their argument becomes irrelevant due to positive EV. You will run into situations that will complicate your chase pattern. Let's say you bet $50 with a count of +4 and you lose. The count starts to drop. I continue to give chase as long as the count is positive. If it goes negative in the middle of your chase you seriously want to consider backing off when you are risking your higher bets. The reciprocal of this is starting with a small bet and the count starts going up. This gives you great cover. If you max out your original chase with a bet of $40 but the true count is now up to +2 you can bet $80. If you lose that bet and it goes up to +4 you can double again to $160, and so on. This will continue until your max bet at +6. If you find yourself struggling to get ahead it will be very tempting to get aggressive and switch to a higher chase. I have come out smiling when I have done this, but I would warn against doing it. My most catastrophic losses have occurred when I am frustrated because I have not hit a high count in forever, lost a bunch of hands in a row, and feel the need to try and force the situation. This is a long term investment. There are going to be times when you lose money. Ride out the storm. Long term you will win more then you lose. The greatest advantage chase systems give in card counting is they act as a smoke screen. The pit bosses are not as likely to pick up on the fact that you are counting if you are doubling up in poor counts. Money management is key whether you use chasing or a flat approach. You need 500 times your minimum bet to get started and should never risk your entire bankroll in one session. This puts card counting out of the reach of many amateurs wishing to enter. If your minimum bet is $10 then you need a bankroll of $5,000 to get started. If you are serious about counting the best way to handle this is to create a group and split that cost between you. It not only allows you to share the burden but allows for team play. Casinos are aware of team play and are on the lookout for it, but if done well it is still really hard to detect. There is power in numbers.